I finished one sock. I'm going to try to start the second one before I get on the plane. Kyle is very envious of my sock. He covets it. 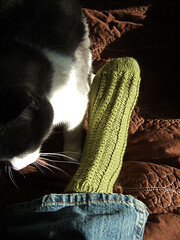 He wants his own pair, but he stipulated I use multi-colored yarn. I'll have to keep an eye out for some truly ugly sock yarn. That'll learn him! This sock is way too thick to wear with shoes. I guess it's going to be a house sock, but I don't know how practical a 100% wool house sock is going to be. It's very slippery on my hardwood floors.